PLEASE NOTE: This Title is Only Available in Electronic Format! Beautiful on Raw is the sequel to Tonya Zavasta's Your Right to Be Beautiful, which was nominated for 2004 Health Book of the Year by ForeWord magazine. Discover a natural way of eating that can dramatically improve your appearance and your life! Frustrated with costly, invasive or ineffective ways of improving your appearance? In her eye-opening first book, Your Right to Be Beautiful, author Tonya Zavasta shared the natural way she helped herself become noticeably more attractive. How? With the raw food lifestyle. Now with her new book, Beautiful on Raw, Tonya responds to the two questions most often raised by her enthusiastic readers: "Can you tell us about other women who achieved the same remarkable results? and "Where can we find recipes to help us make this transition? In Beautiful On Raw, you will read about the experiences of Tonya and 10 other women, ages 35 to 65. The stories of their astonishing results with the raw food diet will inspire you and help you see that you can do it too! 'Beautiful on Raw - UnCooked Creations' by Tonya Zavasta. The book starts with Tonya's own amazing health and beauty transformation story and continues with many other womens stories. Inspirational in that they all cure health problems and become sleek and younger looking. The second half of the book is recipes which are presented in an unusual format that we really like. There is a page with the recipe and a page with lots of nutritional info about the main ingredient - what a powerhouse of valuable facts this is. 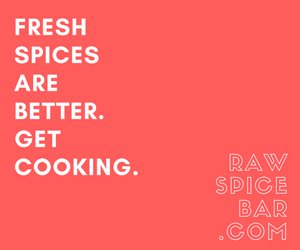 Recipes sections are sprouting, juices, salads and dressings, living soups, appetizers, entrees, snacks, cookies, pies, cakes, shakes and smoothies. Try lusty, luxurious lasanga, pizza, meatless meatballs or satisfy a sweet tooth with macadamia cheesecake, chocolate sheet cake or blueberry pie. Hate cooking? I do too. What if I promise you that you do not have to cook ever again? It is a well-known fact that the less food has been processed, the more sound it is nutritionally. So why process at all? Why not trust the Creator of human life with food as well? Why not recognize the laws of nature instead of looking for a way to go against them? To process food is an arrogant notion - we seem to be saying that God's menu needs improvement. Human beings cannot create life and yet we assume that we can manufacture better foodstuffs. The only food fit for human beings is raw plant food from God's table such as fruits, vegetables, nuts and seeds. But we replace this ample and nutritious diet with the cook's concoctions. By cooking our food we are killing nutrients that keep us alive and healthy. Cooking removes the goodness of food. Fresh fruits and vegetables have a life force that is carried by enzymes, the biochemical catalysts that constitute the difference between life and death. Nature's plan calls for food to deliver its own enzymes to assist the body with its digestion. But enzymes are killed when temperature rises above approximately 118° Fahrenheit. Cooked food depletes the body's own enzyme reserve and curtails its rejuvenating power that has to keep you healthy, youthful and beautiful. Dear Tonya, I just wanted to let you know how much I am enjoying your recipes for the spicy red crackers and the macademia nut banana cookies. I had given up on finding a dehydrated cracker that I liked until I tried yours. They are wonderful!! Also, I absolutely love your facial cream!! I am really looking forward to your new book. I just wish that it would be out sooner. I am hoping that I can make it to Tennessee sometime to a potluck to meet you. Tonya Zavasta overcame many obstacles to achieve her radiant health and beauty. With practical simplicity, she shares her story, showing how the principles of the raw food lifestyle can help you stimulate and sustain your body's rejuvenating ability, which will significantly improve your health and help you become truly beautiful. I have to write you to tell you how much I love your new book, "Beautiful on Raw." Everyday, I am motivated to continue towards a raw food diet by something I read in your book. 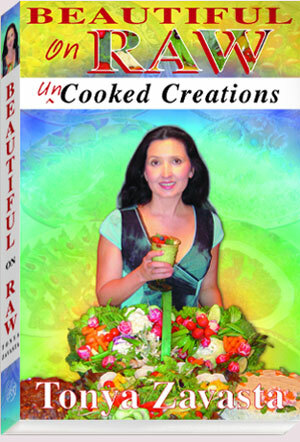 Your interviews with women who are, like you, succeeding on the raw food diet are inspirational. Your own journey is awesome - and you look so beautiful. Your recipes I have tried so far have been delicious. And, I am even more motivated to eat the truly healthy raw fruits, vegetables, nuts and seeds after I read your descriptions of each in your book. Thank you for writing such a fabulous, encouraging and insightful book. I will certainly tell my friends and family about your book. But Beautiful on Raw contains more than just Tonya's experiences-it includes extensive interviews with other women who have achieved the same astonishing results. Their stories will inspire you with the confidence to realize that you can do it too! Have really enjoyed "Beautiful on Raw", and have shared it with several others. Thanks for the excellent research, writing, and delicious recipes. Thanks. I let out a little shout of joy when I saw your book in Wild Oats this weekend. I'm loving it!!!! And I love the beautiful cover. The timing was perfect, as once again, I am trying to eat almost 100% raw. I will not begin by attempting 100% again but perhaps one day. However, I will be very close to it. I KNOW you are right. The testimonials of raw foodists are unlike anything I have ever seen in all of my studies of nutrition. These people are not just free from illness; they live life on another plane from the rest of us. I want to be on that plane. Yummy raw desserts including Clever Carrot Cake (better than baked! ), plus snacks, treats, smoothies and more! Why not join the adventure and find a beauty that glows? 'Beautiful on Raw - UnCooked Creations' is different from your 1st book, but as Great, as useful, as helpful and more and more and I love it so much. I use it and read it and learn from it every day. It is so useful everything you are teaching that the more I know, the more I wish to transform my life. Many thanks for all this Great Work. In creating these recipes great respect was exercised in the treatment of original "from scratch" ingredients. Every effort was made to preserve their color, taste and texture. You will love to prepare these simple but delicious servings without destroying the nutritional value of God's given food. This book will make it easier for you to follow the raw food diet and nature in turn will safeguard your health and beauty. I purchased your other two books and the face cream in Shelby N.C. at the Women Retreat. I have read both of them twice and enjoyed them so much it was hard to put them down even for a little while. Here you can see pictures of selected recipes. Nourishing and lavish with nutrients this is a healthy substitute for chocolate lovers. This is a delicious, quick and easy recipe for a luscious, silky carob shake fortified with raw-food goodness. Coconut, bananas and tahini make it a high protein, high fiber and high energy shake that will keep you satisfied for hours. Kids love it and will never know they are getting a dessert packed with potassium from the bananas as well as other health and energy building ingredients. This is a Middle-East originated sweet. First created as a royal dessert. It is one of the oldest, if not the oldest, Turkish dessert going back over a 1000 years. The word halvah means literally 'sweetmeat'. The halva is made with sesame seeds. The tantalizing tahini (ground sesame seeds) is rich in calcium, zinc, iron, phosphorous, protein, niacin and lecithin and many B complex vitamins. The final result is a beautiful blend of tahini, coconut oil, and raw honey, decorated with swirls of carob sprinkled with walnut, it melts in your mouth. Halva provides protein as well as vitamins and minerals, which for those with young children makes it a healthy choice for an after-school snack that is still sweet and rewarding. I just want to let you know that I truly enjoy the two books I bought from you, especially -BEAUTIFUL ON RAW. The recipes are very tasty, the borsch, torte - I just love them. I like to marinade my food and finally I am getting a good taste of it. Thanks a lot. You will wish you had known about this cake when you were a child. No destructive refined sugar, no glue forming denatured flour, no fattening artery clogging butter. Just Omega-3 rich flax seeds, cancer fighting filberts, sun-ripened raisins, delicious pineapples, mangoes, blueberries, and tangy lemon peel blended into rich, nutritious, nutty fruit cake that is full of fruit flavor. It combines old fashioned goodness, traditional festive appeal with a holiday spirit. For optimal satisfaction, chunks of fruits and whole nuts are used. It is finished off with a carob glaze and decorated with fruits and nuts. Fresh apples and pears are combined with fluffy macadamia cheese for a unique experience. A sumptuous apple-pie is the quintessential autumn dessert. Apples are abundant and rightfully begin to dominate the market. In contrast to traditional apple pie which bakes into a squishy, mushy, shriveled mass requiring a load of sugar before it can be eaten, this pie is crispy and the luscious scent of green apples is heaven on earth! The presence of original fruit colors and flavors guarantees that the nutritional value has not been destroyed. 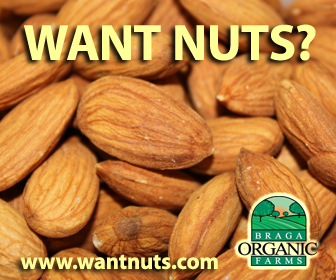 It is topped off with crushed walnuts, lemon rind and cinnamon. No sugar, no flour and no butter! Only the wholesome goodness! Your perception of apple pie will be changed forever. Perhaps best of all, this apple pie is very easy to make. You can purchase Beautiful on Raw: unCooked Creations at my Natural Beauty Store E-BOOK ONLY!